So, this is one of those posts where I tell you to ‘do as I say, not as I do'. I'll get to that part of the story soon, but first, here's the situation. 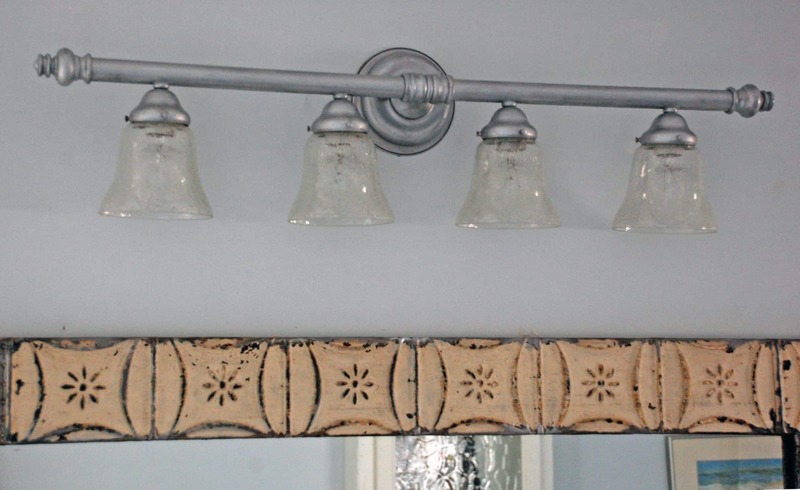 We have a light fixture in our Master Bathroom that started to show some rust. We do have a steam shower in there and I guess we weren't as diligent as we should have been in using the exhaust fan. (We're better now). 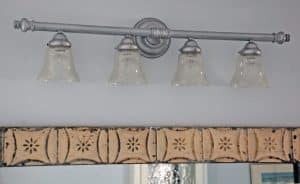 Anyway, the light fixture is up rather high and my husband never even noticed the rust, but I noticed it when changing the bulbs and it kinda bugged me. I've been pondering ways to cover up the rust for a year now, and recently realized that Rub'n Buff was my answer. I've used this product before and have been pleased with the results. Rub'n Buff is a metallic wax that comes in 12 colors and I've had great success with it on picture frames. I taped up paper behind and around the fixture. Rub'n Buff dries very quickly and if I got it on the wall, I knew it was there to stay. I needed to sand down the rusty areas, which was much easier than I thought. Here's where the ‘do as I say, not as I do' part comes in. I should have gone ahead and sanded, deglossed and/or primed the areas that weren't rusty as well. It seems that Rub n' buff needs to have a porous surface to adhere to and the sanding gives it that. In the areas that I didn't sand/prime the surface, the product will rub off (not real easily, but if you take your finger and rub on it, you will get a little residue). I will say, in my defense, that I scoured the internet and all I read about Rub'n Buff is that it will adhere to just about anything, with no real prep needed. C'est la vie. Since this fixture is 8 feet off of the ground and won't be touched at all, I'm not stressing about it for now. Then I wiped down the fixture REALLY well to remove sand dust and regular dust/dirt. I then applied the Rub'n Buff. This stuff is really easy to work with. I have found it works best for me to put on rubber gloves and use my finger to apply it. I had some Silver Leaf Rub'n Buff, but knew that was too ‘silvery' and bright for what I wanted. So I got some of the Pewter product. My Michael's store has the gold and silver, but I had to order the pewter from Amazon. I found that the Pewter was a little too dark, so then I went back over it lightly with some of the Silver Leaf. This time I used a toothbrush as I didn't want a real complete coverage. 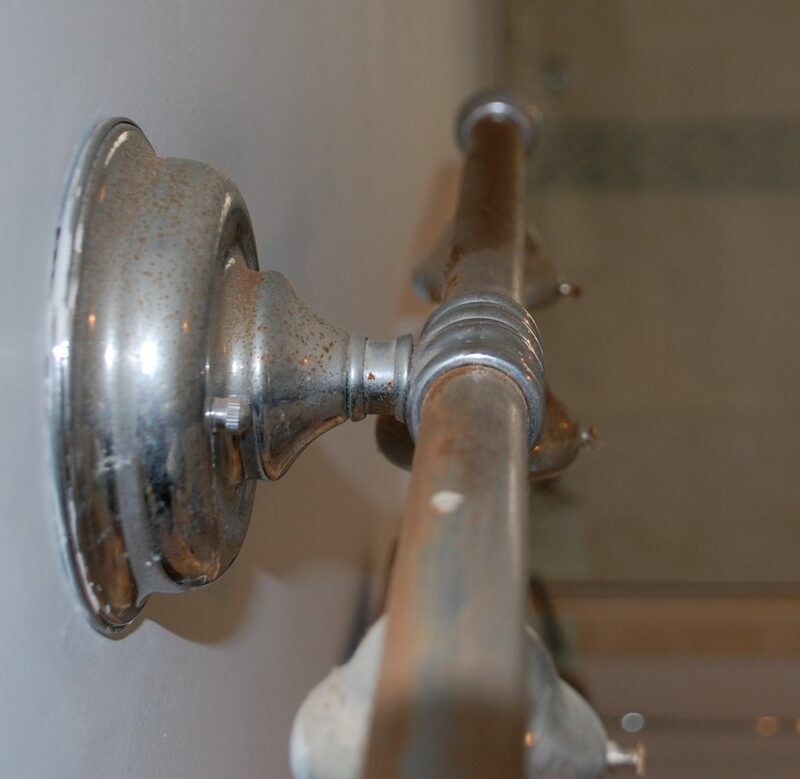 I like the look of the of the silver over the pewter…it has a bit of a tin or galvanized steel look to it. I did buff the fixture after I was done, which is when I noticed that it rubbed off in the real smooth areas. What I would do different next time: I would try a deglosser and/or prime the metal. There are 2 primers that I have used recently. XIM Primer and Rust-Oleum Clean Metal Primer. I'm pretty impressed with the XIM and the label states that it adheres to both ferrous and non-ferrous metals, so I'd probably give that a whirl first. 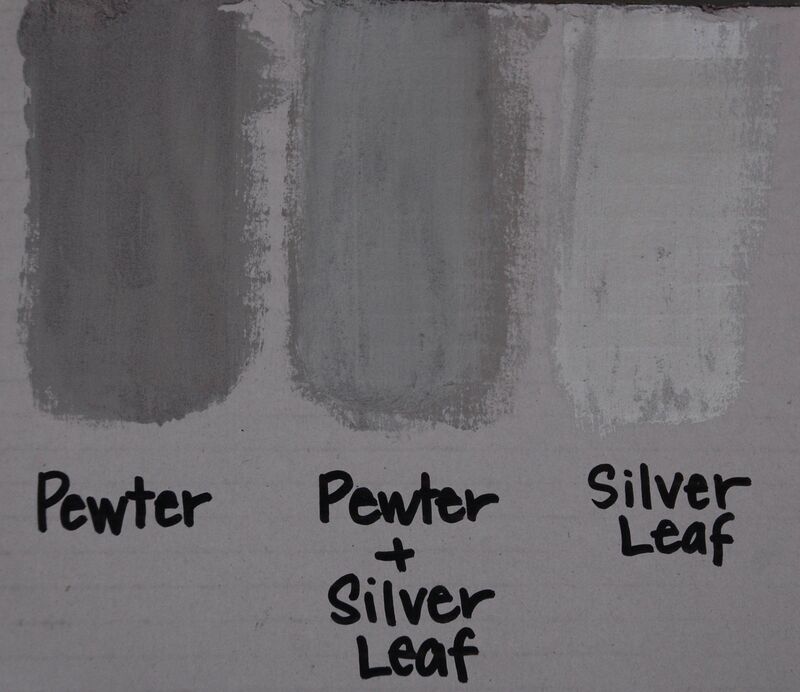 I did a little sample for you to see the difference between the pewter and the silver leaf, and the two together.